When you install a volume license version of Office Standard or Office Professional Plus on a new PC, you might be prompted with a Let's get started screen each time you start Office. This can happen if you don't uninstall the pre-installed version of Office on your new PC before installing a volume license version of Office. To stop the prompts for activation, make sure your Office uses volume licensing and then update the registry. Compare your screen to this screen shot and look for the following. Volume license versions have a Change Product Key link. If you see buttons named Manage Account or Update Options, you're not using a volume license version of Office. 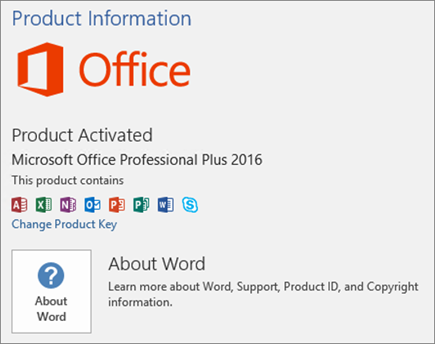 For help with activating other versions of Office, see Activate Office. Important: This task contains steps that tell you how to modify the registry. However, serious problems might occur if you modify the registry incorrectly. Therefore, make sure that you follow these steps carefully. For added protection, back up the registry before you modify it. Then, you can restore the registry if a problem occurs.